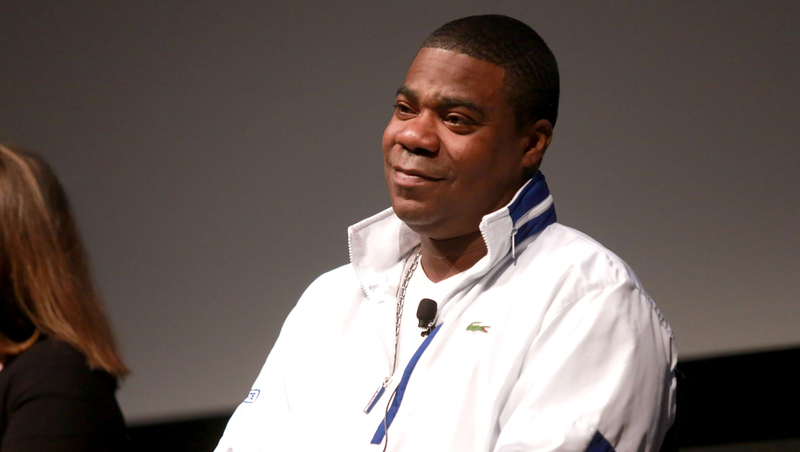 Tracy Morgan's year of recovery from severe injuries and the grief of losing his friend, comic James McNair, in a collision with a Wal-Mart truck last June has been a wrenching challenge, he revealed in his first interview since the crash. Morgan, 46, who suffered traumatic brain injury, a broken leg and broken ribs when a Wal-Mart tractor-trailer collided with his limousine while returning from a performance in Delaware on June 7, 2014, broke down Monday while speaking to Matt Lauer on the "Today" show. "I can't believe I'm here," Morgan said, grasping for words and grasping his cane as the interview began. The former "SNL" cast member and "30 Rock" star, accompanied by his attorney Benedict Morelli during the interview, reached a settlement with Wal-Mart company last week. Morgan said he does not remember anything from the accident, and had been in a coma for two weeks when he woke up to learn that his friend "Jimmy Mack" McNair had died. "He was a loving man and he was a warm man," Morgan said while crying. "He was a good man. It's just hard for me to see that he's gone." Following his release from the hospital, Morgan said that he watched footage from the accident and McNair's funeral on YouTube despite its wrenching effect. "I had to know what happened to my friend, I had to pay my respects," he said. "That was my way." "Bones heal, but the loss of my friend will never heal," Morgan said. "The case is settled, but the pain is always going to be there." Morgan's emotional trauma is compounded by the physical pain and challenges he has experienced in the year since the accident, Morgan said. He listed memory problems, frequent nose-bleeds and headaches and scars on his face that are hard to ignore. Morgan, who is a father of four and told Lauer he will soon be getting married to his fiancee Megan Wollover, shared his gratefulness to his family and friends who have "kept his spirits up," including former cast-mate Tina Fey for her regular phone calls. "My goal is just to heal and get better because I'm not 100 percent yet. I'm not." he said. "And when I'm there, you'll know it. I'll get back to making you laugh, I promise you."